"1,001 Days in the Bleachers"
Former Chicago Reader sports columnist Ted Cox shares some of his favorite stories from 25 years of covering Chicago sports on Chicago Tonight at 7:00 pm. Read an excerpt from his book, 1,001 Days in the Bleachers: A Quarter Century of Chicago Sports. What drew you to sports writing? When I first started trying to write it, I realized no one was writing about it the way I was thinking about it. Most took quotes from the players and coaches about strategy, but not focusing on the moments of drama that were on the field. That’s why people enjoy sports. There was a lot of stuff said when I was in college, that if people see it on TV they don’t want to rehash it. But people want to read and talk about what they’ve seen on TV, it seemed to me. You had to be visual as a writer, because good writing is visual. You wrote, “The bonding of baseball players, who spend so much time together, is vital to the team, but it needs to be experienced firsthand, inside the locker room.” What did you learn, given the access you had? You do need to recognize they spend this incredible amount of time together. There have been so many attempts to knock down that wall, but it remains this hidden part of the game--what do players do on their down time? Is there a community among the team? You get glimpses of that every now and then, but when the locker room doors close, you don’t know what goes on after that. Early on, with the Jordan years, it helped to be there for the press conferences, because they were a sharp team adept at strategy and were open about talking about it, how they were processing the other team without giving away too many trade secrets. It gets overlooked a lot now, but when they were playing the Blazers, they leaked their scouting report to a Chicago Sun-Times reporter. They did that right as the finals started, so the media are asking the Blazers if they’re chokers. They put the media to work planting seeds of doubt in the opponent. You say one of your biggest pet peeves was reporters who complained about athletes who gave “bad quotes.” Why? You’re a reporter and that’s your job. It’s incredibly difficult to master these sports, doesn’t matter which sport it is. And if you get to that point and you can talk eloquently about it, more power to you, but it shouldn’t be expected of you. How many artists or businessmen are able to talk about it very openly? You should be able to do it for them as the reporter--that’s your job. Did you grow up a sports fan? When I was first a sports fan, I was 9 years old, in 1969, and the Cubs infected me. I grew up with Chicago as a loser town. It was always losing. 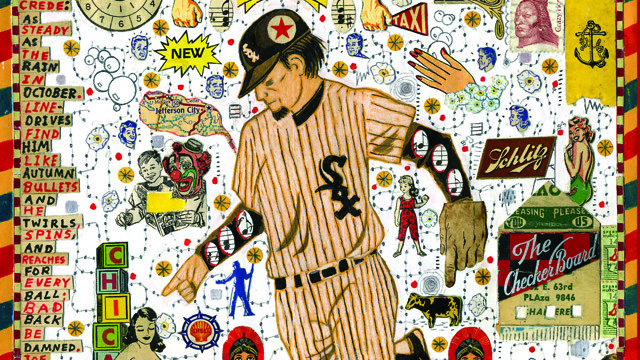 When I went to college, I read tragedies and depressing novels, and I wanted to capture the tragedy of the Chicago sports scene the way a novelist would. I was super lucky in terms of timing. The first year, the White Sox finished first, then the Cubs finished first, then the Bears won a championship. Then Jordan arrives on the scene in 1984, so there was a lot to write about. Tell me about the night that the White Sox won their division and you stormed the field. It gets forgotten by a lot of people--two nights in a row people poured out into the field and were very well-behaved. Within a few years of that, every time a team came close to clinching it, they would bring in the cops and keep people out, and there was never any reason for that. We just wanted to share the field with the players. It’s like people storming the courts in basketball. You’re both in it and above it, and that’s a conflict with being a sports reporter. I was literally lifted off my seat by the crowd, and there was a freedom and looseness when you were on the field, but you’re also trying to preserve all of that when you try and write about it the next day. You have to not get overheated in your writing. You also say you got to realize a childhood dream of living in an apartment with a rooftop view of Wrigley. Why was that so powerful for you? As a kid growing up in the suburbs, you learn to watch the game from watching TV, and one of the great educators was the channel 9 director, Arne Harris. You had bleacher bums teaching you to experience the whole ballpark. To this day, a lot of Chicago sports fans are attuned to that. So it was ideal to having a rooftop apartment to watch games. Now it’s all bleachered-up and owned by corporations. Back then, the building was roach-infested and it was a nice perk. Wrigley has the aura it does because of the relationship it has with the community--it has no upper deck on the grandstand, so the rooftops are part of the backdrop. Kevin Garnett played for Farragut in the Chicago Public League when you were a columnist. What was high school-era Kevin Garnett like? To this day, I’ve never seen any high school player with the ability and size of Garnett. Garnett was a dervish and could ball-handle, and he was 6' 11". Now, he’s much more specialized and more beefed up. But he used to be rail thin, and you knew he was going to be something great.